November 21, 2018 By This post may contain affiliate links. 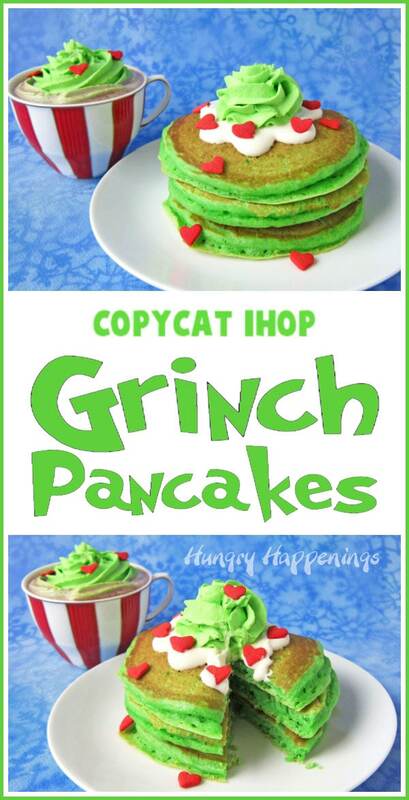 You can make your own Copycat IHOP® Grinch Pancakes at home. 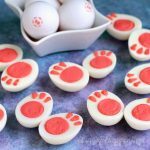 Your kids will love waking up to a stack of fluffy green pancakes topped with cream cheese icing, green whipped cream, and red candy hearts for Christmas breakfast. 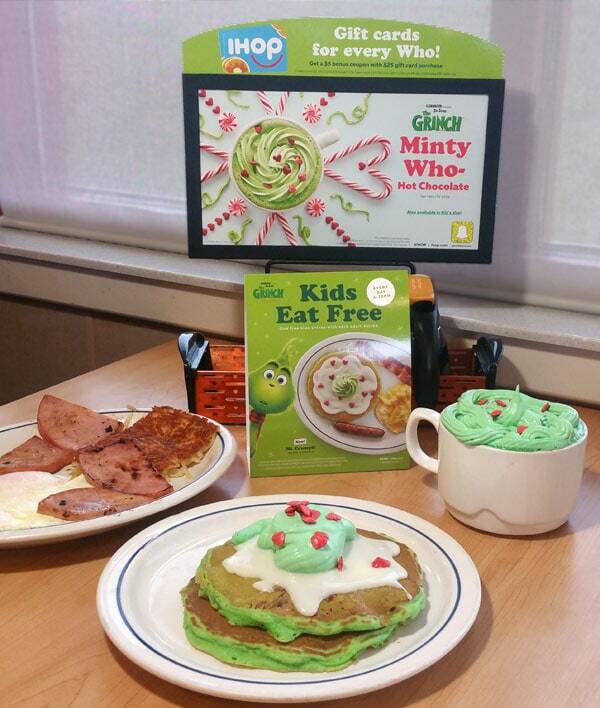 Have you been to IHOP for some Grinch Pancakes yet? I have and I enjoyed every bite of the fluffy green pancakes topped with a sweet and silky cream cheese icing and a swirl of perfectly flavored green whipped cream. Oh, and I can’t forget about the red candy hearts that were sprinkled on top. They were tasty too. My husband and I made a special trip to IHOP last weekend just so I could try the new Grinch’s Green Pancakes. I hadn’t been to IHOP in years but we were heading to see The Grinch movie that afternoon so it just made sense to go completely out of our way to eat green pancakes for breakfast. I am so glad we did. I felt like a kid again. I’m sure I was the only adult in the packed restaurant who ordered the fun holiday pancakes but I definitely wasn’t alone. Practically every kid in the place had a plate of the green pancakes in front of them. I couldn’t resist also ordering a cup of Minty Who-Hot Chocolate too. The hot cocoa flavored with mint extract is made grinchy with a swirl of green whipped cream and red candy hearts. It was a delightful addition to my meal which also included eggs, ham, and hash browns. Needless to say we didn’t need to order popcorn while watching The Grinch being the breakfast was so good that I practically licked my plate clean. We stretched out in our comfy theater recliners, surrounded by families, to watch the newest, heartwarming, version of the holiday classic, The Grinch Who Stole Christmas. I loved every minute of it. It’s sweet just like the Grinch Pancakes. My husband, however, was not a fan. He much preferred the original, more grinchy version of the movie. Of course, after having such a festive holiday breakfast I was inspired to make my own version at home. If you follow me here you know that I pride myself in creating unique and original recipes like my Chocolate Pretzel Snowman Crafts, Stuffed Pizza Skulls, Conversation Heart Cheesecakes, and Frosty Snowman Pretzels, many of which have been copied and shared online (sadly usually without any attribution) but I just couldn’t resist re-creating these copycat IHOP Grinch Pancakes. If you have an IHOP near you, definitely go order a stack of their Grinch Pancakes and enjoy feeling like a kid again. 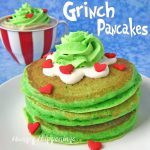 For those of you who don’t or who just want to be able to make a fun Grinch themed breakfast for you and your kids, give these pancakes a try. Start by making the cream cheese icing and the green whipped cream. Beat together softened cream cheese, powdered sugar, vanilla, and milk until smooth and creamy. I left my icing rather thick being I wanted to make sure it didn’t spread too much when I took pictures but my pancakes had cooled off too much by the time I actually stacked them and added the icing so it didn’t spread at all. It tasted great though and gives my pancakes a very carton-like appearance. When added to hot pancakes the icing will spread. If it is too thick you can add a bit more milk to thin it out. Add some green food coloring to heavy whipping cream and sifted powdered sugar and beat until the whipped cream holds stiff peaks. I started with some neon green food color then added a drop of green liquid food coloring and I love the final color. It matched the pancakes really well. I believe IHOP uses liquid green coloring to color their green whipped cream. It had a much lighter green color. Make the green pancake batter. Whisk together flour, salt, baking powder, and baking soda. Then whisk together an egg with buttermilk and pour it into the flour. Stir just until combined. The batter will be very lumpy at this point. Do not keep mixing. Add sugar, vanilla, melted butter, and green food coloring and stir just until combined. 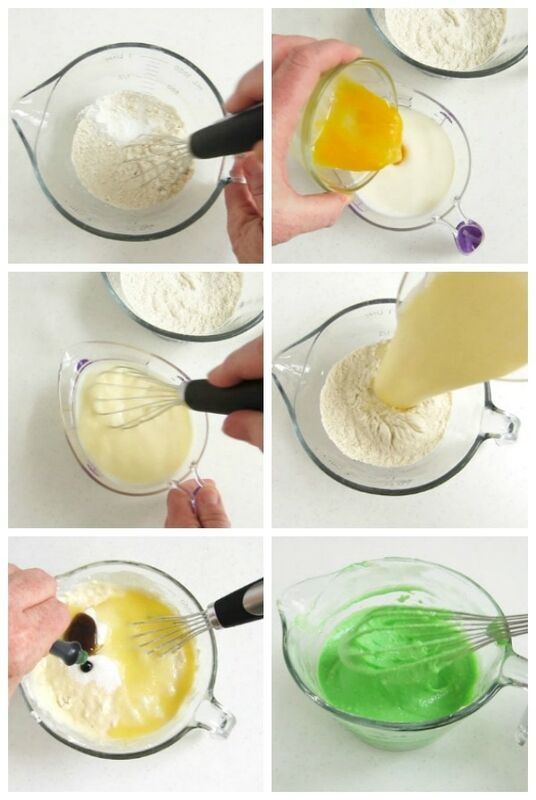 Add more green coloring if you need to but DO NOT mix the batter until smooth. You want to have some lumps remaining in your batter. Why do I want lumps in my pancake batter? It’s important for your batter to have some lumps in it. If you over-mix pancake batter you will overwork the gluten in the flour and you will end up with chewy or rubbery pancakes instead of fluffy pancakes. If you look at the picture above of the green pancake batter, you’ll notice the lumps in the tines of the whisk. 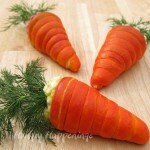 What green food coloring should I use? I made a few batches of these pancakes as I was working on the recipe and found that liquid green food coloring gave these pancakes a bright green color that looked perfect. I tried using electric green coloring in one batch but the pancakes looked really too yellow. Pour a small amount of vegetable oil into a skillet or griddle and set over medium heat. Let the pan heat until the oil begins to separate into small droplets. To test if your pan is hot enough you can add one drop of water into the pan it should form little beads and dance around the pan. Use a paper towel to rub the oil into the pan leaving just a thin layer of oil. Having a thin layer of oil in the hot pan will ensure that your first pancake will have a nice even golden brown color. If you leave the drops of oil in pan, the batter that sits directly over top of those drops will brown more quickly forming dark spots on your pancakes. Pour about 1/4 cup of the green pancake batter into the pan. Bubbles will begin to form in the batter. 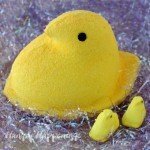 Let those bubbles form and pop. Once you start seeing bubbles that pop and stay open, and the edges begin to look set, your pancake is ready to flip. Let the pancake cook through on the other side then remove from the heat. How can I keep my pancakes hot until I’m ready to serve? Place a cooling rack in a warm oven (250 degrees F). Set the cooked pancakes on the cooling rack allowing them to stay warm. Using a cooling rack allows even heating from above and below the pancakes. 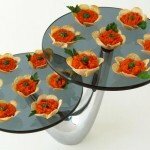 If you just set them on a baking sheet the bottoms may become soggy. If you don’t have a cooling rack then flip the pancakes over to allow the underside heat up and dry slightly. Plate one, two, or three pancakes. Spread some cream cheese icing on top. You will have enough to add some to all 8 pancakes. You may have some left over if you just spread it over the top pancake on a stack. Pipe or dollop on some green whipped cream. Add some red hard candies or sprinkles. I used jumbo red heart sprinkles. 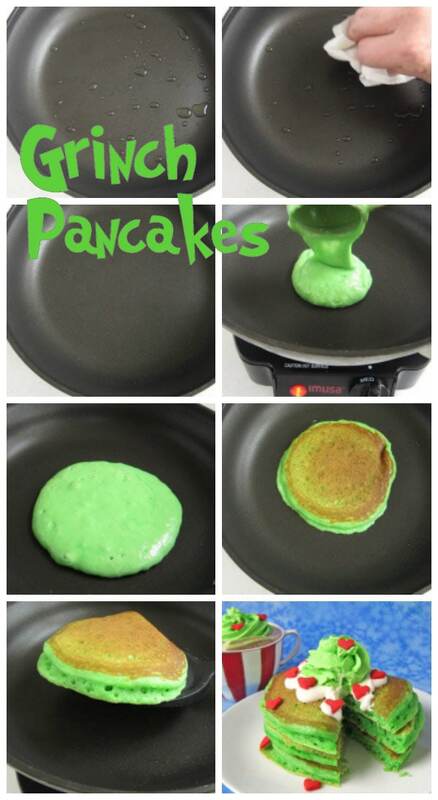 You can find supplies needed to make these green Grinch Pancakes on amazon (commission earned for sales). A homemade version of IHOP's Grinch's Green Pancakes. These fluffy green holiday pancakes are topped with cream cheese icing, green whipped cream, and candy hearts. Beat together the cream cheese, powdered sugar, vanilla and 3 tablespoons milk until smooth and creamy, adding more milk as needed until the icing is the desired consistency. Pour heavy whipping cream, sifted powdered sugar, vanilla, and a few drops of green food coloring into a mixing bowl. Beat on low speed using an electric mixer until bubbles form then increase the speed to high and beat until the whipped cream holds stiff peaks. Keep whipped cream refrigerated until needed up to 1 hour. In large bowl, whisk the flour, salt, baking powder, and baking soda. Whisk together the egg and buttermilk. Pour into the flour mixture and stir just to combine. Add sugar, melted butter, vanilla and green food coloring and mix until blended but with lumps remaining. Drop a small amount of vegetable oil into a skillet or on a griddle and place over medium heat. Once the oil begins to separate and move around the pan, use a paper towel to rub it into the pan, leaving just a light coating on the pan. Ladle about 1/4 cup of the green pancake batter onto the pan. Cook until bubbles begin to form on surface and edges begin to set. Gently flip your pancakes over and cook until lightly browned on both sides. Repeat with remaining batter making between 8 and 10 pancakes. Stack warm pancakes on a plate then spread on some of the cream cheese icing and add a dollop or swirl of green whipped cream. Sprinkle on some candy hearts and serve immediately. 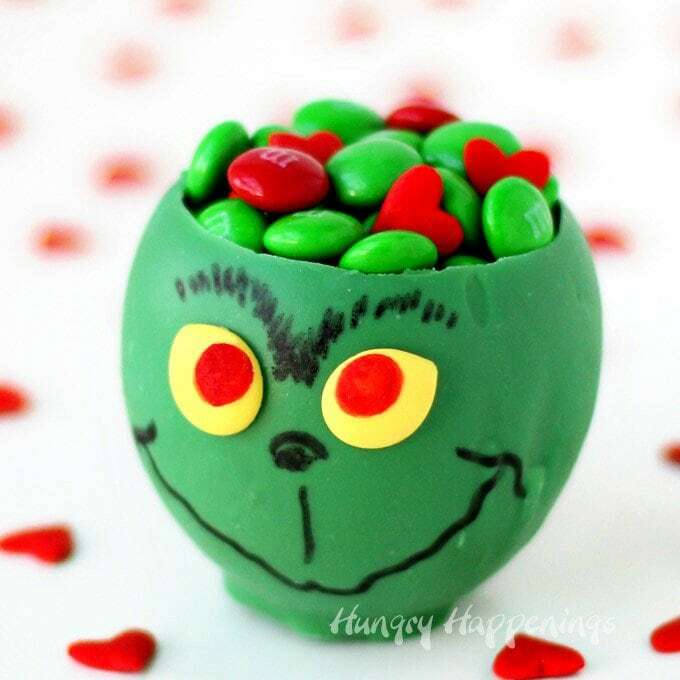 If you love The Grinch you might also like making these Grinch Candy Bowls. 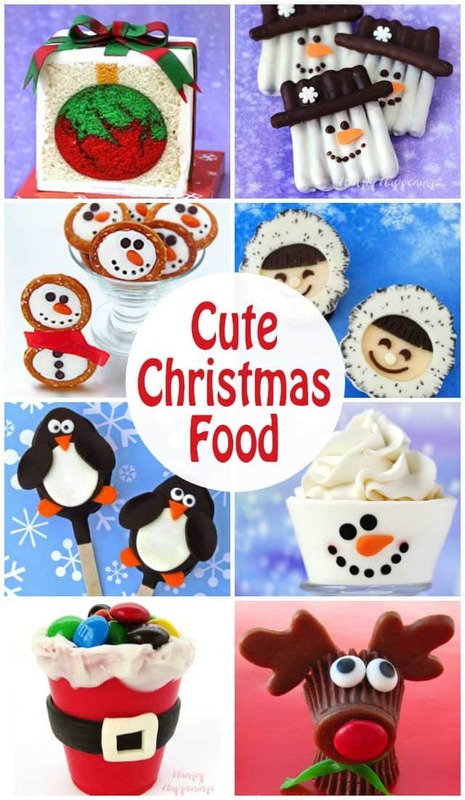 See more festive Christmas Recipes here. This is just so fun…the last time my family went to a movie, instead of dinner and a movie, it was breakfast and a movie, so this would be perfect! Your Grinchy pancakes warm my heart! I do have an IHOP near my home, but your version is even cuter!! Where have I been..I didn’t even realize there was an updated version of one of my favorite movies! Awe, I’m so happy they warmed your heart. Definitely go see the new movie. It is so sweet. I bet you’ll like it. 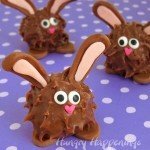 These are just adorable an look tastier than IHops. I will have to make your adorable pancakes. These pancakes are really tasty and I do hope you and your kids enjoy making and eating them! I loved the ones at IHop too and if you have a change to dine there for some Grinch Pancakes I highly recommend it. I’ve seen the movie, at the IHOP Grinch pancakes, and even have a recipe for Grinch Fudge which was made this morn…….and yes I was planning to make and give to friends so they would be having these for breakfast Christmas morn! Thank you! Thank you! Thank you!! Merry Christmas!! 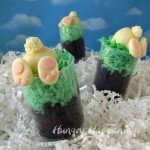 Yay, I’m so happy to hear you have made the grinch fudge which we posted over at HowToMakeEasyFudge.com! That’s been such a popular recipe this season. I hope all your friends enjoy their Grinch Pancakes on Christmas morning. I’m sure your gathering will be a lot of fun. Thanks so much. 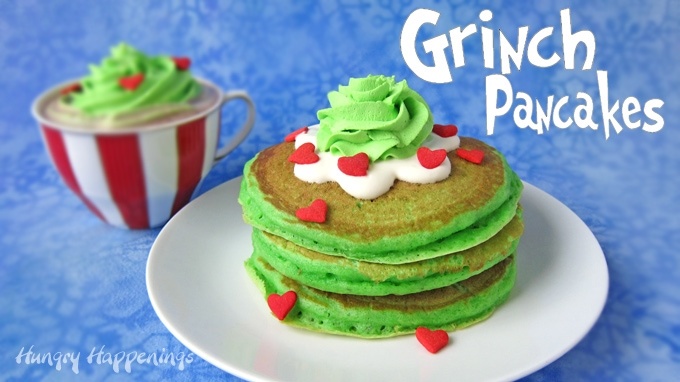 I’m glad you liked these Grinch Pancakes enough to feature them on your site. 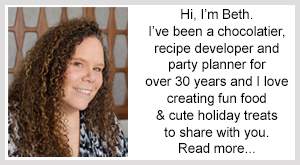 I am so happy to have been able to provide you with a recipe so you can make Grinch Pancakes at home for your son. I do hope he enjoys his fun Christmas breakfast! I am allergic to some nuts and had no idea IHops pancakes have nut cross contamination. That is good to know!